Tucked away in the Straits of Bonifacio, is the Maddalena Archipelago, just two kilometers off of the coast of northern Sardinia, also known as the Costa Smeralda. 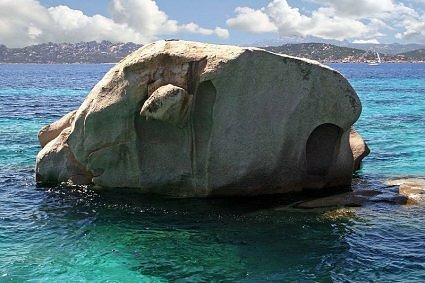 Only accessible by yacht or ferry, the Maddalena Islands are a perfect spot in which to slip into an isolated anchorage to enjoy a bit of time far from the maddening crowds when on yacht charter in Sardinia. Often compared to the British Virgin Islands, the Maddalena Islands are known for their close proximity to one another for easy cruising, crystal clear waters and the many anchorages and coves indenting the coastline of the islands where it is easy to have a beautiful anchorage all to yourself. 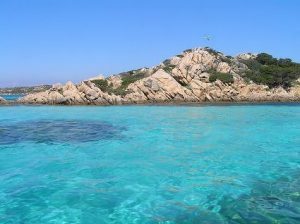 The Maddalena Archipelago is spearheaded by La Maddalena Island, which is surrounded by Budelli, Caprera, Razzoli, Santa Maria, Santo Stefano and Spargi. This group of small granitic rock islands has been inhabited since prehistoric times, most heavily during Roman times, and is most well known for the beauty of the crystal clear waters reflecting off of the granite, which creates intense summer colors evocative of summer dreams. Surrounding many of the islands are pink sand beaches, with boulders of granite balanced in various natural sculptures. Several of the islands are uninhabited and protected as natural habitats, and the island of Caprera is linked to the Italian patriot of independence, Garibaldi, who settled there until his death. His home is now a museum to be enjoyed by visiting yacht charterers. Dotted along the sea bottom around this and other Maddalena Islands are the remains of Roman cargo ships waiting to be explored by amateur underwater archeologists or just the vacationing yacht charter snorkeler. A week can easily be spent on charter just in the Maddalena Islands, however a great charter would be to include the Maddalena Islands in a charter of the northern coast of Sardinia or the Costa Smeralda and sail between the coast and the various islands in the Maddalena Archipelago. On your charter yacht you will be able to anchor and swim in waters rarely visited since Roman times in this archipelago, taking time for yourself to relax in beautiful surroundings, or pop into the harbor of Porto Cervo in the thick of the Costa Smeralda to hob nob in luxury in this chic spot, before slipping off to the secret coves back in the Maddalena on a yacht charter itinerary that offers the best of both vacation worlds.